This new touchscreen system was developed for a customer that provides tug services and personnel/materials transport to oil platforms and offshore wind farms throughout the Atlantic, North Sea, Baltic Sea and Celtic Sea regions. This touchscreen provides a quick and intuitive interface at the helm for the ship operator to change their billing rate on the fly based on their current task being completed. This touchscreen system, coupled with the amazing breadth of data collected by the gplink remote monitoring system satisfies requirements for SEEMP data reporting and is the only system of its kind available for commercial fleets in the industry. 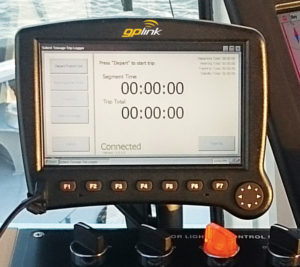 The gplink Remote Monitoring system can be installed to any ship whose engines have J1939 or J1587 available, which includes most major engine manufacturers. With the precise fuel reporting and early notifications, this new touchscreen control system, usually shows a return on the investment in less than a year’s time – not including the peace of mind of 24/7 monitoring and SEEMP compliance for your commercial fleet. Initially developed by the International Maritime Organization, Ship Energy Efficiency Management Plan (SEEMP) is a set of operational guidelines for all heavy commercial vessels exceeding 400 tons, which places a strong focus on a vessel’s continued improvements in fuel efficiency through intelligent engine speed and route management, resulting in decreased greenhouse gas emissions.